Pigeons. You either love them or hate them. Just ask someone . . . anyone . . . and you're sure to get a "coop" full. I personally think that pigeons are super cute. Have you ever watched a pigeon walking away down the street? They look like they're wearing little knickers. It's adorable! Unfortunately, pigeons often fall victim to misconceptions and misinformation. Many believe, for instance, that pigeons carry diseases that are communicable to humans. This is simply untrue, according to Nicole Benson, an animal advocate who has rescued dozens of pigeons and has never come down with a disease. "These misconceptions are put out there by pest control companies who want your business," she says. "While there are a few diseases that a pigeon may carry (such as salmonella), it is far more likely that we will infect a pigeon with one of the diseases that we carry." How do you feel about pigeons? Pigeons are very smart birds, who have been used in times of war to save troops. The birds worked as couriers to deliver critical messages. Benson has worked with pigeons suffering from a variety of ailments and describes them as sweet birds with fun personalities. "I have been coo'd too, danced for, wing slapped, pooped on and cried for," she says. "The young ones will see you as their momma or pappa. Then as they become adolescents, they will become more independent, much like human teenagers, sometimes exerting their will, but also wanting your love. As adults, they settle down with a mate for life and share parenting duties." I have personally watched her coax an injured pigeon out of the street and into her arms. "I can't understand why you would leave one there if you have the ability to help," she explains. "I mean, if I came across an injured grackle or mockingbird, I would have no idea how to help them, but I think that I would still try." One of the challenges Benson faced early on was finding a vet who was friendly to wild birds. Many vets won't even look at a pigeon, while others provided subpar care or just opt for the easy fix: euthanasia. Pick up the bird and place him in a box or cage. A cage made for guinea pigs works well. Place his cage in a warm, dark area to calm him. He's probably very scared and in pain. 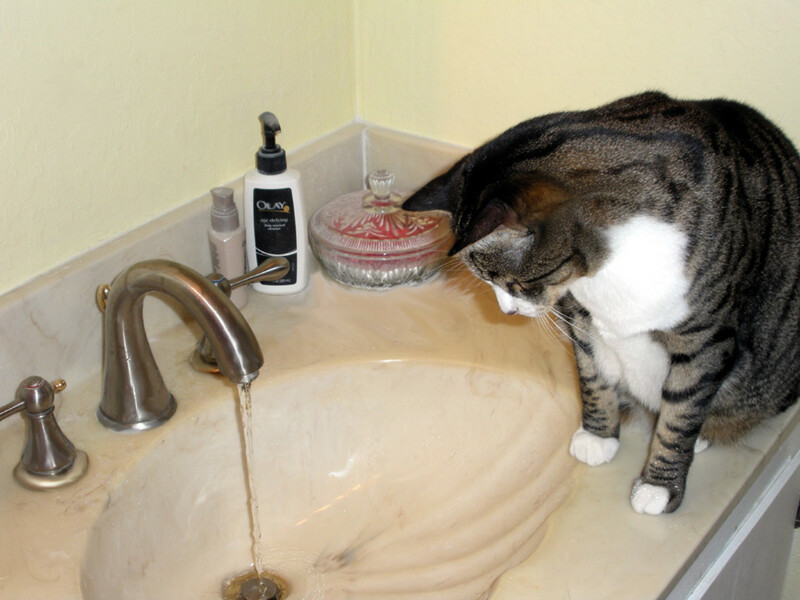 While he is in the quiet, safe area, prepare an electrolyte solution: Warm a cup of water. Add a pinch of salt and sugar, making sure it dissolves. When the water is lukewarm, pour it into a deep cup. Pigeons drink water by sucking, using their beaks as a straw. Don't try to feed him at this time. He needs to be rehydrated first. If you have a warming pad, you can place it in his cage or box, and place a towel over it (maybe an old dishtowel). Set the pad on low. Check the pigeon for obvious signs of injury: Drooping wing, bleeding, cuts. Watch for pigeon droppings. These often serve as an indicator of what is ailing the bird. If the bird is drinking and seems to be doing OK, after a while you can provide the bird with seeds, if you have them. Wild bird seed is fine in a pinch. Pigeons love safflower seed and unpopped popcorn, both of which can be found at a grocery store or other market. They should also be given the smaller millet seed, a basic component in wild bird food. If the bird is not eating, he will need immediate help. Pigeons have a high metabolism and need to eat often. Broken Wing: A pigeon with a broken wing is usually unable to fly. Sometimes the wing is drooping or dragging. Occasionally there is bleeding or a protruding bone. Causes vary from the pigeon getting clipped by a car, a close encounter with a cat, even high winds that throw them against the side of a building. In some cases a vet can repair the wing, but often times the pigeon is handicapped for life. Pellet Gun Wound: With this type of wound, you would notice a hole in the pigeon. The wound should be examined for possible infection by a vet. The bird will probably need antibiotics, regardless. Broken Feet: More common in areas where there are fishermen. The pigeons' feet can become tangled in fishing wire or other loose string. This is very dangerous for the pigeon because it can cut circulation to the foot and become badly infected. Also applies to other types of birds hanging out near fishermen. 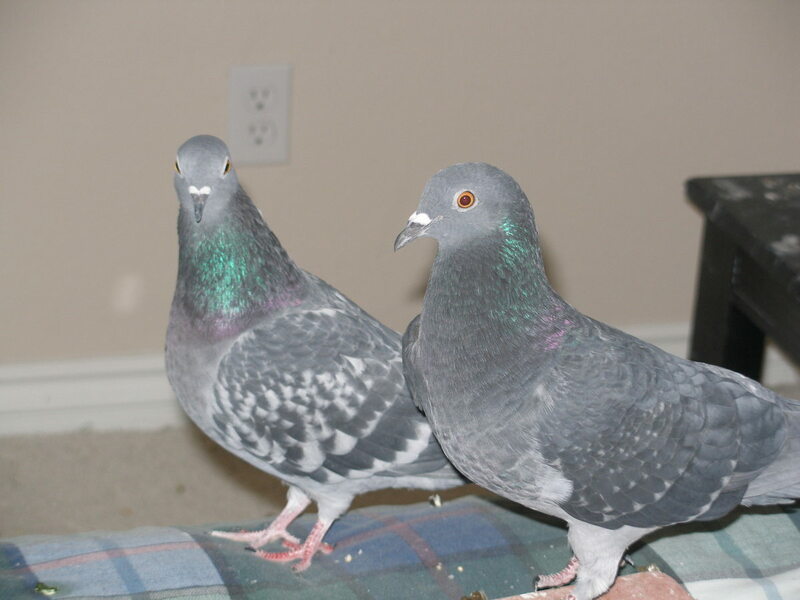 Visit The Pigeon Forum and add a post about your bird. The people on this forum are helpful and can assist you in finding a vet, getting meds, or connect you with a rehabber in your area who can walk you through saving the bird's life. Visit the Palomacy Facebook page to ask for help with an injured pigeon. Read 21 amazing facts about pigeons. Don't be discouraged if you take a pigeon into your care but you're unable to save the bird's life. Not all pigeons can be saved. "You did what you could," says Benson, "and, at the very least, provided the pigeon with a safe, warm place." If you are flummoxed by an increase in pigeons around your home, don't take drastic measures like hiring an exterminator or shooting a pellet gun. The birds' sudden arrival is most likely the result of an increase in food. 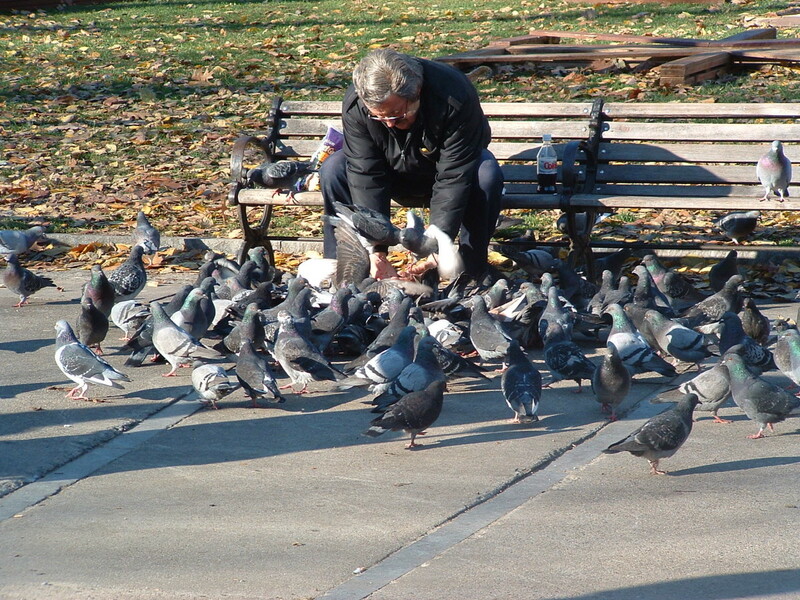 Once the source of food is eliminated, the pigeons will leave. "The pigeons will eat the seeds in your yard, then move on," says Benson. "It's that or deal with weeds later. Besides, their poop is the best fertilizer -- full of nitrogen!" One solution for keeping pigeons at bay involves putting a reflective material that will move with the breeze on your roof. The motion and reflection will discourage the birds from landing. Have PIGEON in the back yard that apparently can't fly much. It seems to be able to fly just enough to keep out of the reach of the cats. Trying to keep the cats away but it is difficult. If I can cath it, where should I take it? Where should i take a pidgeon who hurt its wing? To the local animal shelter? Hi there i have found what seems to be a baby pigeon in my garden, i have tried to look around for a nest and the parents. Couldnt locate the nest there are a couple of adult pigeons around but they are not taking any notice of the little one. Found pigeon stuck in garden checked under wings feet can't see injury. No blood. Beak looks so dehydrated aged. I saved a pigeon from our garden by climbing under a tree through nettles and brambles she could run but can't fly I think she has a Broken wing but am not sure what are signs of a broken wing ? I accidentaly punched a pigeon with a bottle while feeding them, it flew directly into the bottle's edge. He staggered a bit and didn't eat with the other pigeons. Minutes later he flew away to a second floor, kept a bit staggered and then flew away. Tdavis -- google if there is a bird rescue centre near your area that you can take him to? They often take in birds for free. For now, try to give him some water to drink by dipping your finger in water and then touching his beak. He should start to drink after a while. I found a pigeon. His neck keeps twisting. He also can't walk or fly. What can i do to help this bird. I have no money. If you're still seeking help, try reaching out to the Palomacy Page on Facebook. Someone may have an answer. Hello, I rescued a Rock Dove on my street. She has a drooping wing and crippled toes. I took her into my home in a cardboard box, fed her seeds and gave her water. The next day, I call the wildlife rehab. (Hope for wildlife) and a volunteer picked her up on the same day. Now I am waiting for news about her condition. Hopefully she makes it. Also, where I live, nobody is going to go to your house to rescue your pigeon, unfortunately. You need to capture your pigeon and bring them in. Some people use a sheet or towel, but I'm not very good at that. Food, a giant cardboard box, a prop, and some string can work, and my local shelter lets you borrow cat traps for free. You should be able to bring the pigeon to you by feeding closer and closer to you. I wanted to warn people that if you can't find a wildlife or bird rehabilitator, and instead raise the baby pigeon yourself, you shouldn't release them or let them outside. They don't know how to survive and usually die within several months. If you want to let your bird outside, you should build an aviary. Even a cage firmly attached to a rear window can provide sunshine and safety, although I can't guarantee the pigeon will be impressed. Some do survive the indoor-outdoor life for over a decade, so it can be done, but you really have to know what you're doing (or be very lucky). Also buy a loud whistle, a soft whistle, and a flashlight, and teach your pigeon a special song. If your pigeon ever escapes your home (too many sad stories like this), you can play your special song and shine a light in sync to help guide your pigeon home. I have a injured pigeon in my garden .it is his wing. He walks around garden all day living under my conifer tree. My dad found a pigeon today, he was hit by a car and stunned, he seemed to perk up a bit later and we tried to set him free but he can't fly and he is also leaning forward. I have found a pigeon with its back claw on the right leg injured. It is unable to balance properly and stays tilted to the left. I have bandaged it's claw. Please help me treat it back to normalcy. We have an injured pidgeon that has survived an attack by a bigger bird. It has a hole in its lower back. Have put it in a cardboard box with a cloth, water and bread. I managed to get it to drink a fair amount of water. Have just read that it needs sugar & salt in the water to rehydrate it and that it likes unpopped popcorn. Will try that. Even laid my hands on him & asked God to heal him. Evey day pigeon come inside my room fly from window to the top of the cupboard. I dont know what comes in her mind flew up to the cieling fan.. Bang.. loud noice and pigi fall on the ground. So i pick her up seem like blade torn off feathers from body and an injured. Pigeon can walk. but one side of the wings chopped away . I put ice cube on his leg where trace of blood. I want to know what are the home remedies. Here is the picture of the queen. Found a pigeon. Looks like a pellet gun wound. Couldn't get the guinea pig cage out. Used the hamster cage instead. Wasn't sure what to do. I can't find emergency vet. Found this page very helpful. is there a way to contact Nicole Benson? A friend of mine found this article and thought that it was me. I have had a string live for pigeons my entire life, I am a licensed wildlife rehabilitator, animal advocate and pigeon finatic. I live in Toronto Ontario and I am Nicole Bensons twin and I also love pigeons. It is scary. Really scary! I just sent the picture of Nicole in this article to my mother, and a few friends and it blew their minds. I would to send her a picture of me with my pigeons! This is a great article, thank you for writing it! I've rescued a pigeon. No obvious signs of injury. Checked feet seems unsteady on them. Wings seem fine. Took him home placed in a large hamster cage. I have bird food. Now what.!!!!!!!!!!!!! Thank you. Hey everyone! I need some urgent help! I have come across an injured pigeon with a broken wing. He seems to be in pain. I have kept him in a box and given him some water. If anyone has some useful advice please help ASAP! Found a pigeon that was being mauled by a local cat in the Lowestoft area, the pigeon has a drooping wing & can't seem to fly any suggestions for helping appreciated. This is a great post with good info for pigeon owners. As well as just those that run across injured pigeons. @twilightpigonchic Google Pigeon Talk, it's an online forum where you can find help. @JoAnn - Don't euthanize! The pigeon can still be very happy. As my pigeon expert friend Nicole tells me, pigeons are good pets who can be content in a cage (like something made for a guinea pig or a rabbit). Add a mirror because they actually have facial recognition and they can be very vain! 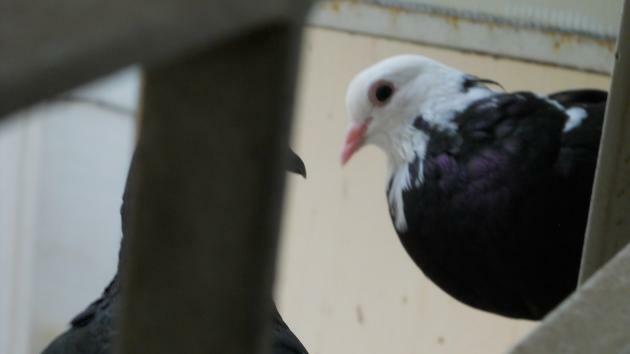 Also, there are some rescuers who are looking for a mate for their non flight pigeon. You may be able to find on on Pigeon Talk, an online forum. I found a pigeon with a broken wing that isn't healing well at 5 weeks. I have to make a decision to euthanize him or have him live a life in a cage in my hallway that seems like a life without quality for the pigeon. He's not in pain but doesn't can't enjoy life in a NYC apartment. Can he be happy in a cage or should I just euthanize him at the vet? Voted up and awesome. When I did volunteer rehab work in DE, I cared for many a pigeon. Young ones(including Mourning Doves), are basically the same. They want to be held and cuddled if you will do it. They are very gregarious. People fear what they don't understand, many times. I have never met a bad bird, only a handful that were afraid and did their best to protect themselves. I've saved a couple of pigeons (and a crow) on the streets of Paris where I live and I'm amazed at people's reactions, either for or against. I've often found that people's loathing of pigeons is projective in nature. @Mike Are you interested in relocating them? @Wasteless Project I would love to read your story! Thank you for this beautiful post - I recently had a surprising pigeon experience in my life, too - since then I am a pigeon-lover:) I think it's worth sharing this story with you people as soon as I find the time to write about it! @Thadrok Ha! They do indeed. @ImaSurvivor74 Definitely do it. I can't wait to read it! Immensely interesting while at the same time completely random! I like pigeon's they make funny sounds. Great to see another bird lover/rescuer. I find myself always advocating for the crows against the misconceptions as well. 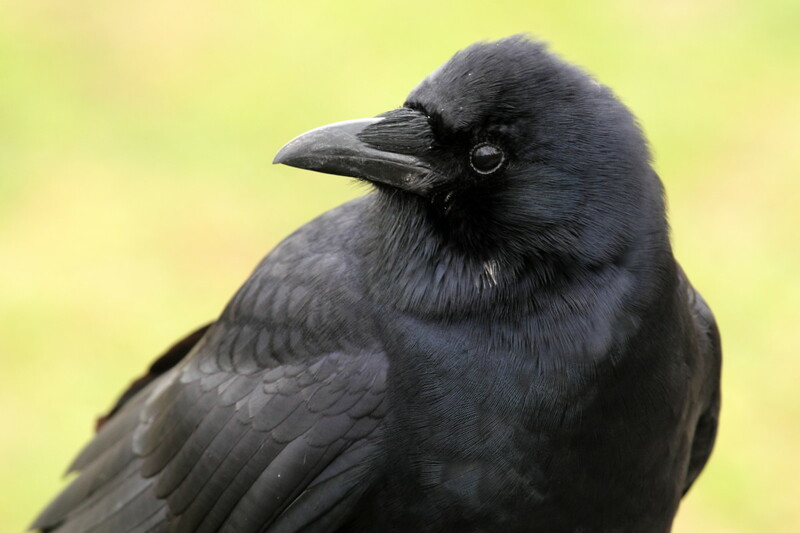 You have given me the motivation to maybe hub about the misunderstood crow. @Lyn.Stewart : I will try the netting idea, since alezafree also agrees with you. Very nice hub. Thank you for the information. @Gemini Fox I am excited to hear that! Thank you so much for reading and commenting. Good hub! I have to admit that although I really love animals, I, too, thought that pigeons carried diseases and were more vermin than wild bird, so to speak. But your hub changed all that! Will never look at them the same way again. Thank you! @melbel I wonder that too. 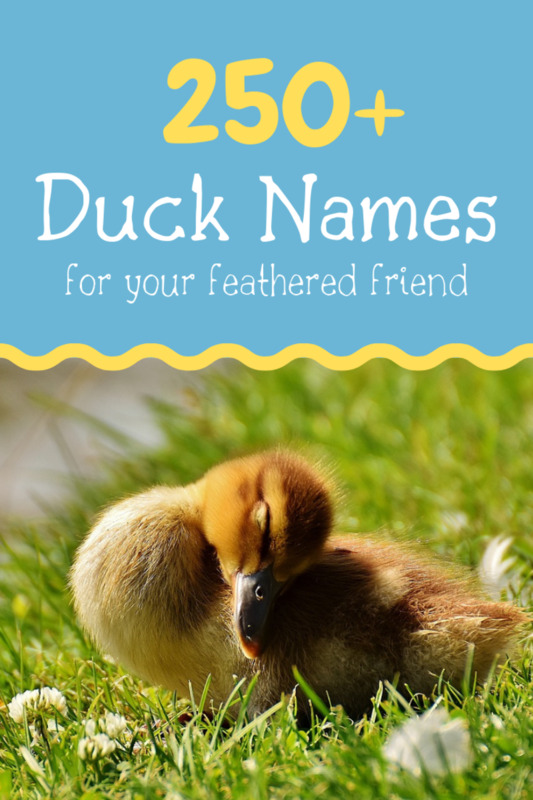 they have similar body structures (not just the whole both being birds thing, but the whole shape of their body and how their head and neck are attached). I am curious. I will have to look into that! @TwilightDream Thanks. I agree with @Lyn.Stewart's advice. Good luck!! @Lyn.Stewart Great advice! Thank you for jumping in!! @Nettlemere That is awesome! You sound like a very caring person! @susanc01 I loved your hub. Those pictures made my day! @Brainy Bunny I appreciate your honesty. I will need to do some research on pigeon nests. 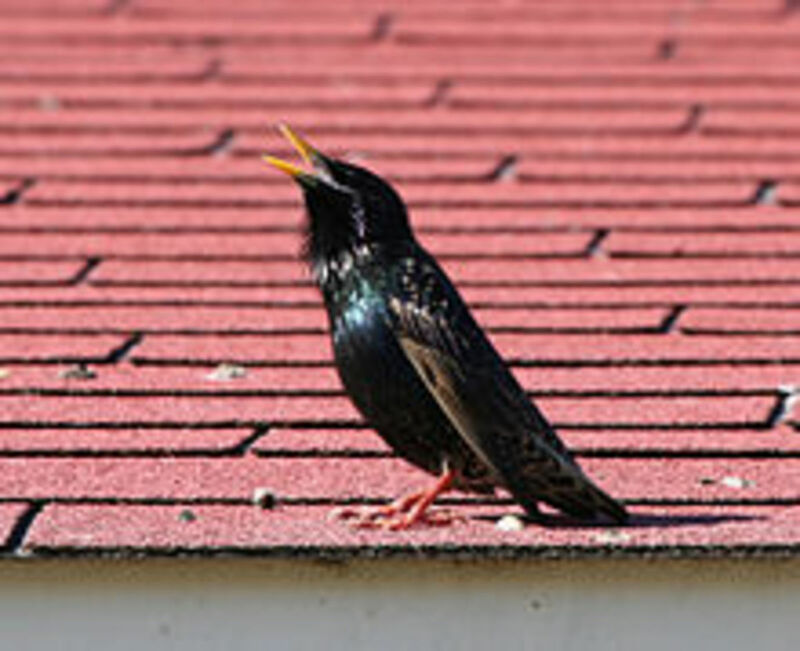 I know they do sometimes nest on people's roofs, and that can be problematic for the homeowners. @geetika iyer Thank you! I absolutely feel you on this. I watched Nicole help a pigeon in need once and it really hit me hard that I had walked past injured pigeons in the past without a thought. It really changed me. Thanks @LGrey! Your pigeon loft sounds cool! @vespawoolf Thank you! It warms my heart to hear you helped the pigeon recover. @Liz21 Yes! And they apparently recognize their own reflections too which is pretty cool! @Moon Daisy I know I just love how the babies are so fluffy! Awww, not I feel bad for the babies. You've really changed my mind about them. I know next to nothing about pigeons, but they look seagull-y to me, which makes me wonder if they are related. TwilightDream ... you ould always put some netting over half your garden so you can finally grow something and let the pigeons have the other half. Great hub I have had to catch a pigeon to cut string which was so tight it was cutting into the birds toes and foot which looked really fat and deformed. I saved all but one toe. Nice hub for bird lovers. Yes. Pigeons are very smart bird. We do have lot of them around my home. They eat the seeds from my home garden every night. Even though their poops are good fertilizer, once they eat away the seeds, my dream of gardening goes off. Since I am also a bird lover, I watch for them every morning. It becomes my great relaxation. Congrats for 'Hub of the day'. Keep writing! Very pleased to read about pigeons, I hand reared a collared dove once and for many years had an ex racing pigeon who'd been handed into my local vets with its foot shot off. Thank you for the hub, fellow bird lover! Very informative and an excellent read, voted UP! Please take a minute to check out my hub on the nest of baby birds that we photgraphed in our yard in Kentucky over the course of a several weeks in the spring of 2011. 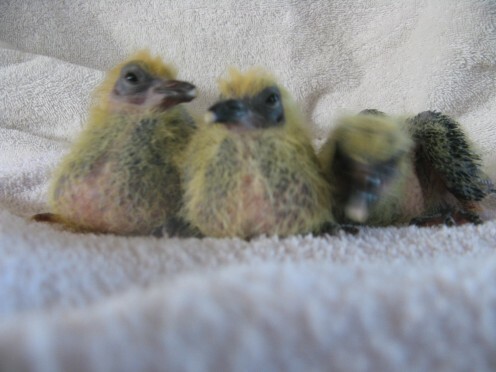 I'm not a fan of pigeons, but I have always wanted to see what baby pigeons look like, so thanks for the photos. Any ideas where pigeons nest? I've seen plenty of other birds's nests, but never pigeons (and I used to live in NY, so I have had plenty of pigeon encounters!). Great hub! Its really heart warming to see that you have not only felt the pain of these neglected creatures but have managed through your hub to include others in this deed. I swallowed hard after reading this;I was daunted by my own strange eye towards pigeons and the fact that I should have tried to help them. Never too late. Will remember this hub forever as the constant reminder to "live and let live and once in a while lend a helping hand"! What a great hub! I love pigeons too. I just came in from my pigeon loft. 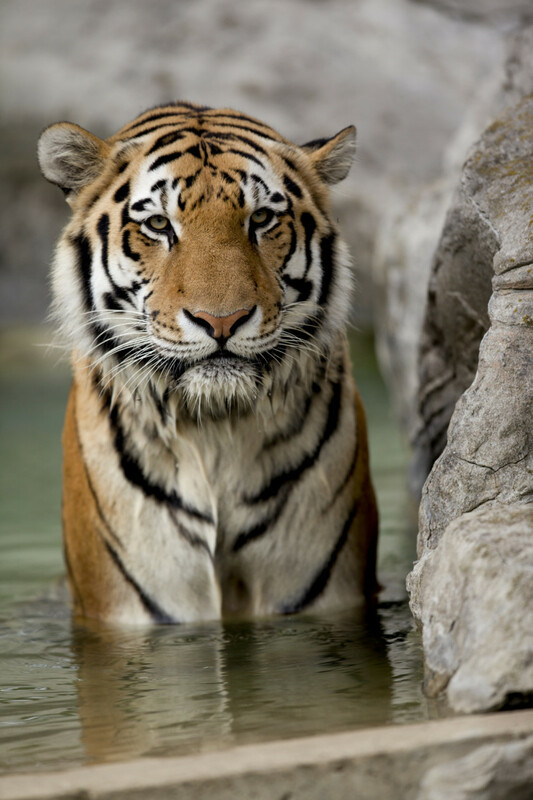 They are such smart beautiful creatures. Really enjoyed reading this. This information is so timely. Just yesterday a pigeon flew into a window and was stunned. Fortuntely, it recovered in about an hour after resting in a box. 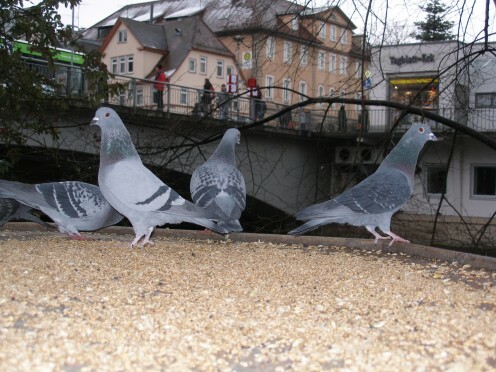 I agree that pigeons are super cute, and I had no idea they like unpopped popcorn. Congratulations on HOTD! Nice pigeon hub! I live in London where there are lots of pigeons, (although I know they are just everywhere), but I have never seen a baby pigeon. I have often wondered what they looked like. So thank you for that! They look very cute and scraggly, a bit like turkeys. @grandmapearl Thank you for your comment. I am glad you enjoyed the Hub and the fuzzy pigeons. @drsteffan I am sorry about your experience. Hi alezafree! I loved this Hub! You and I share a love for wild birds. 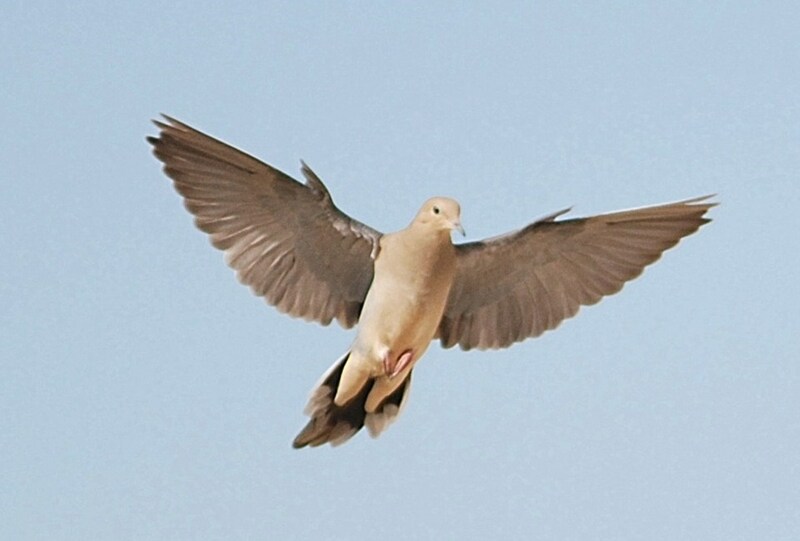 I live in a rural area, but frequently have a flock of mourning doves that visit regularly. There's about 7 of them that work under my bird feeders looking for fallen seeds. Love to hear their soft cooing. 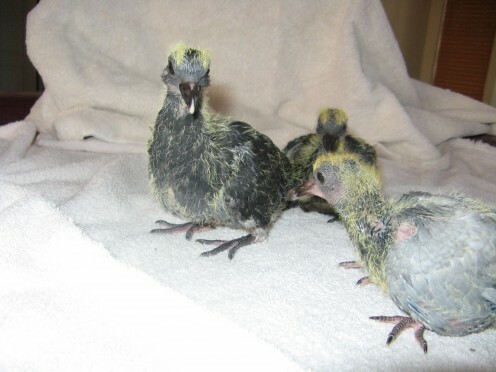 The baby pigeons in your article are so cute and fuzzy! I love the colors of pigeons; so iridescent and pretty. I'm glad to know how to take care of an injured bird like this, should I come across one at some point. Very good Hub. Voted Up, Interesting and Useful, and am now following. @SimoneSmith Thank you for your thoughtful comment. I used to live in the San Francisco area, and boy do I miss it. When I lived in Sausalito, the pigeons were a bit overwhelming at times. I used to see people kicking them (well, trying at least)! At one point there were mass pigeon deaths on Bridgeway, and my friend (a fellow newspaper editor in town) suspected poisoning. As for your question, I am guessing that the deformed pigeon feet you see are indeed broken, or were injured, and never properly healed. Amazingly, many pigeons can adjust to this injury and learn to walk again, or even hop. 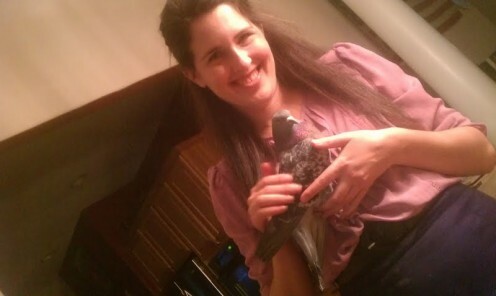 In fact, Nicole (who I quoted in this article) has a one-legged pigeon -- aptly named Hoppy -- that she rehabilitated. This is such an amazing Hub, alezafree! I will admit I'm not the biggest fan of pigeons, but my opinion of them has changed after reading your Hub. It's interesting to know that broken feet amongst pigeons are more common in areas where there is fishing. Are deformed pigeon feet (something I see often in San Francisco) a result of broken feet as well? Or is it something else? @DonnaCosmato Thank you! I'm glad you enjoyed it. Thank you for reading. Interesting article with lots of good tips. I love pigeons too. People have forgotten how useful they were during WW1 and WW2 carrying messages. To me their like any other bird. Enjoyed your hub.